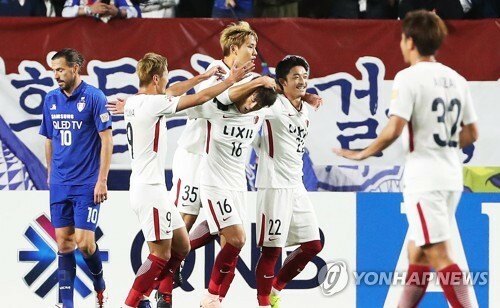 SUWON, South Korea, Oct. 24 (Yonhap) — South Korean football club Suwon Samsung Bluewings failed to reach the final of the premier Asian club tournament on Wednesday after losing to Japanese side Kashima Antlers 6-5 on aggregate. Suwon gave up a late equalizer to Kashima’s Serginho and settled for a 3-3 draw in the second leg of the Asian Football Confederation Champions League (ACL) semifinal match at Suwon World Cup Stadium in Suwon, south of Seoul. The result forced Suwon out of the tournament, as they had dropped the first leg 3-2 in Japan on Oct. 3. Suwon were looking for their first ACL final appearance. The K League 1 side twice won the Asian Club Championship, the predecessor of the ACL, but they have not played in the final of the continental tournament since 2002. Kashima, now heading to their first-ever ACL final, will next face Persepolis of Iran in the two-legged final. Persepolis edged Al Sadd of Qatar 2-1 on aggregate to become West Asia champions. Kashima will host Persepolis on Nov. 3 and will travel to Azadi Stadium in Tehran on Nov. 10. Looking to overcome a one-goal deficit from the first leg, Suwon moved forward aggressively from the start. Suwon midfielder Kim Joon-hyung posted the first shot of the match in the third minute, only to see it fly over the net. Kashima captain Gen Shoji surprised Suwon fans in the 10th when he had an uncontested header in the box. But his attempt off a Serginho free kick was too high. Like the first leg, it was the visitors who broke the scoreless deadlock. Shuto Yamamoto headed down Serginho’s free kick in the 25th for to give Kashima a 1-0 lead. In a bid to improve their attack, Suwon substituted in forward Park Gi-dong to start the second half. Park met Yeom Ki-hun’s cross just two minutes after he entered the pitch, but his header went off target. Suwon’s firepower then exploded. The hosts produced three goals in an eight-minute span and took the lead. In the 53rd, Suwon saw Yeom’s header off Jang Ho-ik’s cross denied by Kashima’s South Korean goalkeeper, Kwoun Sun-tae. But Lim Sang-hyub pounced on the rebound with his right foot to level the score. A minute later, Jo Sung-jin rocked the stadium with a header off Yeom’s corner kick that made the score 2-1. Jo could have earned his second goal of the night in the 58th, also with a header, but was denied by Kwoun. Suwon further punished Kashima in the 60th. Jang threaded a pass to Dejan Damjanovic running into the box, and the Montenegrin forward hit the net off a right-footed strike. It was Damjanovic’s 36th career goal at the ACL, tying the all-time scoring record held by Jeonbuk Hyundai Motors striker Lee Dong-gook. But Suwon’s attack cooled down in the 64th after Kashima cut the deficit to one. Following a Serginho’s cross, Daigo Nishi found the net with his right foot inside the box. Kashima further pushed forward and Serginho stunned Suwon fans in the 82nd after he struck the ball into the right corner of the net and made the score 3-3. Suwon were suddenly left with no option but score at least two goals to secure a ticket to the ACL final. Four minutes were added to the second half stoppage time, but it wasn’t enough for Suwon to produce a miracle.